LYNCHBURG, TN — Fawn Weaver was on vacation in Singapore last summer when she first read about Nearest Green, the Tennessee slave who taught Jack Daniel how to make whiskey. In a photo in Jack Daniel’s old office, Jack Daniel, with mustache and white hat, is shown at his distillery in Tennessee in the late 1800s. 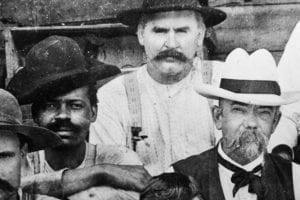 The man to his right could be Nearest Green, a slave who helped teach Jack Daniel how to make whiskey, or one of Green’s sons. that owns the Jack Daniel Distillery here, made international headlines with its decision to finally embrace Green’s legacy and significantly change its tours to emphasize his role. “It was jarring that arguably one of the most well-known brands in the world was created, in part, by a slave,” said Ms. Weaver, 40, an African-American real estate investor and author. Determined to see the changes herself, she was soon on a plane from her home in Los Angeles to Nashville. But when she got to Lynchburg, she found no trace of Green. “I went on three tours of the distillery, and nothing, not a mention of him,” she said. Rather than leave, Ms. Weaver dug in, determined to uncover more about Green and persuade Brown-Forman to follow through on its promise to recognize his role in creating America’s most famous whiskey. She rented a house in downtown Lynchburg, and began contacting Green’s descendants, dozens of whom still live in the area. baron how to distill, but had also gone to work for him after the Civil War, becoming what Ms. Weaver believes is the first black master distiller in America. By her count, she has collected 10,000 documents and artifacts related to Daniel and Green, much of which she has agreed to donate to the new National Museum of African American History and Culture in Washington. Through that research, she also located the farm where the two men began distilling — and bought it, along with a four-acre parcel in the center of town that she intends to turn into a memorial park. She even discovered that Green’s real name was Nathan; Nearest (not Nearis, as has often been reported) was a nickname. An original jug stencil from about 1879.
whiskey produced on contract by another Tennessee distillery; she says she will apply the bulk of any profits toward her expanding list of Green-related projects. “It’s absolutely critical that the story of Nearest gets added to the Jack Daniel story,” Mark I. McCallum, the president of Jack Daniel’s Brands at Brown-Forman, said in an interview. The company’s decision to recognize its debt to a slave, first reported last year by The New York Times, is a momentous turn in the history of Southern foodways. Even as black innovators in Southern cooking and agriculture are beginning to get their due, the tale of American whiskey is still told as a whites-only affair, about Scots-Irish settlers who brought Old World distilling knowledge to the frontier states of Tennessee and Kentucky. Green’s story changes all that by showing how enslaved people likely provided the brains as well as the brawn in what was an arduous, dangerous and highly technical operation. According to Ms. Weaver, Green was rented out by his owners, a firm called Landis & Green, to farmers around Lynchburg, including Dan Call, a wealthy landowner and preacher who also employed a teenager named Jack Daniel to help make whiskey. Green, already adept at distilling, took Daniel under his wing and, after the Civil War and the end of slavery, went to work for him in his fledgling whiskey operation. In all likelihood, there were many other men like Green, scattered around the South. Records are spotty, though references to slaves skilled in distilling and whiskey making pop up in slave sales and runaway-slave ads from the early 19th century. But only one of them helped found a whiskey brand that today generates about $3 billion a year in revenue. The company had intended to recognize Green’s role as master distiller last year as part of its 150th anniversary celebration, Mr. McCallum said, but decided to put off any changes amid the racially charged run-up to the 2016 election. “I thought we would be accused of making a big deal about it for commercial gain,” he said. It didn’t help that many people misunderstood the history, assuming that Daniel had owned Green and stolen his recipe. In fact, Daniel never owned slaves and spoke openly about Green’s role as his mentor. And so the company’s plans went back on the shelf, and might have stayed there had Fawn Weaver not come along. As she tells it, she was looking for a new project when she picked up that newspaper in Singapore. What was meant to be a quick trip to Lynchburg turned into a monthslong residency, as Ms. Weaver discovered an unwritten history, hidden in forgotten archives, vacant land and the collective memory of the town’s black residents. Through dozens of conversations, local people, many of whom worked or still work for Jack Daniel’s, told her about learning Green’s story from their parents and grandparents, holding it as fact even as the company kept silent. 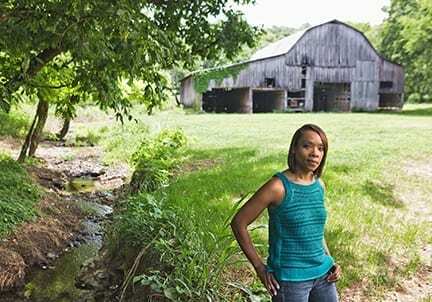 Nothing stays quiet in Lynchburg (population 6,319) for long, especially when it involves the biggest employer in town, and by late March Ms. Weaver was meeting with Mr. McCallum, the brand president, in the makeshift office she had set up in a run-down house on her newly acquired farm. 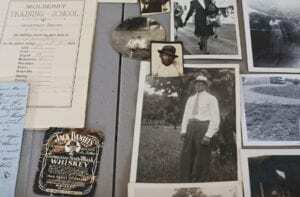 With a sampling of her estimated 10,000 documents and artifacts spread across a table between them, it quickly became obvious that Ms. Weaver, who had no previous background in whiskey history, knew more about the origins of Jack Daniel’s than the company itself. 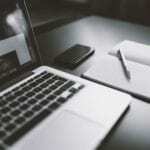 What was supposed to be a preliminary meeting turned into a six-hour conversation. Mr. McCallum says he left reinvigorated, and within a few weeks he had plans in place to put Green at the center of the Jack Daniel’s story line. In a May meeting with 100 distillery employees, including several of Green’s descendants, he outlined how the company would incorporate Green into the official history, and that month the company began training its two dozen tour guides. At one point Jack Daniel’s proposed adding a Nearest Green bottle to its “Master Distiller” series, a limited-edition run of bottles that celebrate its former master distillers, but dropped the idea over concerns from inside and outside the company about appearing to cash in on Green’s name. Instead, Ms. Weaver has released her own whiskey, Uncle Nearest 1856, which she bought in bulk from another distillery. She is planning to produce a second, unaged spirit, made according to her specifications, which she says will mimic the style of whiskey that Green and Daniel probably made. 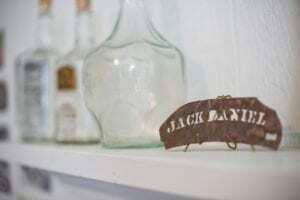 Jack Daniel’s seems unfazed, for now, by the use of Green’s name on someone else’s liquor. “We applaud Ms. Weaver for her efforts to achieve a similar goal with the launch of this new product,” a Brown-Forman spokesman said. And although there is no known photograph of Green, the company placed a photo of Daniel seated next to an unidentified black man — he may be Green or one of his sons who also worked for the distillery — on its wall of master distillers, a sort of corporate hall of fame. Mr. May said that so far, visitor response to the new tours spotlighting Green’s contribution has been positive. It’s not hard to see why: At a rough time for race relations in America, the relationship between Daniel and Green allows Brown-Forman to tell a positive story, while also pioneering an overdue conversation about the unacknowledged role that black people, as slaves and later as free men, played in the evolution of American whiskey. For her part, Ms. Weaver isn’t finished with her search for Green — and may never be. “I’ve lost track of him after 1884,” the year when Jack Daniel moved his distillery to its current location, and Green disappeared from the fledgling company’s records, she said. She is still hoping to find Green’s gravesite, and has recently been traveling to St. Louis to meet with a branch of the family there. “I could be doing this the rest of my life,” she said. Previous articleWill My Baby Develop Pacifier Teeth?